Brave You XinYu Needs Urgent Medical Care. You XinYu is 11 years old. This little girl was abandoned at birth, but was fortunate enough to be adopted by a loving Chinese family who already had one son of their own, but had room in their hearts to love a little girl in need too. The family live a very simple life. Both mama and baba only received education up to 2nd grade of elementary school, are migrant workers and live on 2,000rmb per month. Life is hard but they have love. Sadly, You Xinyu has leukemia. 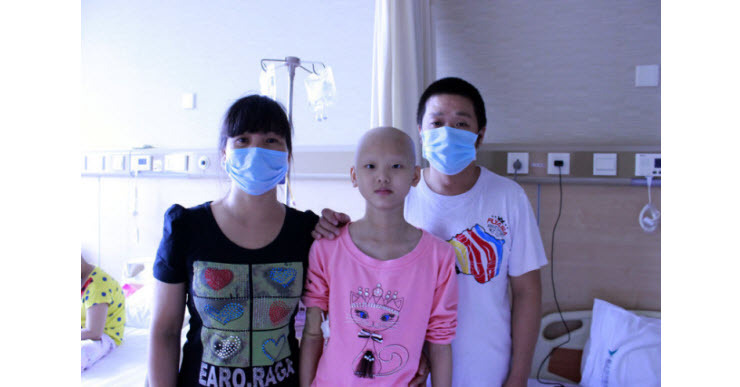 When You Xinyu was diagnosed with leukemia her parents sold their tiny apartment in order to pay for her treatment. Sadly it was not enough, plus there were complications. Due to the specific generic nature of her particular strain of the disease the doctors advised that her best hope was to have a bone marrow transplant from her birth parents. Unbelievably, with the help of the doctors at the Yanda Hospital, word spread about this little girl’s predicament and her birth parents were found. It was also discovered that she had an elder sister who was the perfect match for the transplant. Now though all the money the parents had managed to raise has been used up. They simply do not have the 500,000rmb needed to do the bone marrow transplant plus pay for essential aftercare. Without it Yu Xinyu will die. The doctors at the hospital contacted Roundabout with a plea for help. By the end of September 250,000rmb needs to be deposited in her hospital account in order that the transplant can proceed. PLEASE WILL YOU HELP US TO MAKE THAT POSSIBLE? In total we need to raise 500,000rmb to give this sweet child a chance of the life she so deserves. In the usual gutsy Roundabout spirit we agreed to help. How could we say no? We seriously don’t know where the money will come from, but we have to try. ” My name is You Xinyu. I’m 11 years old, a 5th grader in an elementary school in Ma An Shan city. “My hand is still connected with IV needle, but I no longer feel the pain, because I have help from all of you. I am having fever today, but dad asks me to hang on. I am doing just that and I have finished this letter. Life is hard for my dad. He sleeps on the floor next to my bed at night. These few words are not enough to express my gratitude. Thank you everyone! This from the hand of an 11 year old. Imagine if this was YOUR child uttering these words. The truth is, everyone at Roundabout already works incredibly hard, juggling many medical case finances at once – and every now and again we just need to reach out to you for that extra bit of help. Make a cash donation by coming directly to the Roundabout store in Shunyi. Please email: beckyxiao@yahoo.com for bank transfer information. You might also consider starting a collection at your school, workplace, playgroup etc..
Or come shop in our store as money raised there will also be used to help. Perhaps you could come up with a fundraising activity in your community ? Every single rmb will count, please, please help.